My earliest memory of school takes me back to the summer before I entered the first grade. There was no preschool in my day so my parents sent me to summer school to get me used to riding the bus and the regimen of the school routine. One of the first stops the bus made on the way home was for a boy about my age named Bobby. His daddy was a pulp wooder, and they lived in a very modest house. Bobby rarely took a bath, so he carried an odor. He became an easy target for ridicule. Because his house was one of the first ones on the bus route, it was filled with rowdy, energetic children. One day his mother appeared at the door to greet her son. Her unkempt black hair prompted one child to say, “Look at that witch,” and within seconds the entire bus was yelling, “Witch, Witch,” as the boy made his way toward his front porch and his waiting mother. The Book of Ecclesiastes tells us there is a time to laugh. That implies that there is a time not to laugh. Laughter can be therapeutic, but it can also be misplaced and misused. When that happens, laughter is harmful. It is unhealthy. It cuts to the heart. It wounds. You know that’s true because all of us have been the center of wounding laughter. God has a sense of humor. Just look at a monkey, or a camel or many other animals. Then the insurance company makes their pitch that people who save hundreds on their insurance with their company are happier than a camel on hump day. This company has discovered that humor sells insurance and they do it lobsters, cavemen, a gecko. a walrus, a pig, and dozens of others of creatures. There is no harm is this kind of humor. Just watching children play brings smiles and laughter to our lives. If you have enough self-awareness, you should be able to laugh at yourself, but God also has standards when it comes to the kind of humor that is healthy. When we laugh at the wrong time and for the wrong reasons at inappropriate things, laughter wounds and cuts like a knife. It is laughter, which falls below God’s standards of what is healthy and good for our souls, that I call fallen laughter. Fallen laughter is the laughter of the serpent in the garden as it scoffed at the woman for trusting God’s decree not to eat from the tree in the middle of the garden. “You will not surely die,” said the serpent as it ridiculed the woman for being so naive and believing that God knew right from wrong. The serpent ridiculed the woman, and while it doesn’t say in the text that laughter accompanied the serpent’s words, it doesn’t take much imagination to see it. We’ve all felt this from others. We know what it feels like to have our ideas, beliefs, thoughts, and convictions belittled and laughed at by others. This kind of laughter can prompt us to compromise our values and convictions. How many of you have ever been laughed at or ridiculed for trying to do the right thing? How many of you have ever laughed at or ridiculed someone else for their efforts to do the right thing? At that statement Lucy bursts out with thunderous laughter, sending Charlie Brown rolling in humiliation (Short:132). The laughter of Lucy is the kind that existed on my school bus over fifty years ago when a mother stepped onto a porch just to welcome home her son. It is laughter which every child fears. It is the kind of laughter that we fear even as mature adults that if we are vulnerable for just a second, that someone, somewhere, is going to laugh at us. This laughter is unfriendly, disrespectful, and demeaning. While God is a God who laughs and wants us to laugh, we need to realize that this is not the laughter that stems from the heart of God. The laughter of Lucy teaches us not to trust. It tells us we can never be vulnerable or transparent. This is why we laugh at Charlie Brown. Over and over he trusts Lucy to hold the football while he gets a running start to kick it, only to have Lucy pull it back at the last minute. We laugh at Charlie Brown because we have been him. We have put ourselves out there. We have been vulnerable and risked our feelings, our dreams, our hopes, ideas, and desires, only to have someone betray us, demean us and make us feel like a fool, while others laughed. We have been sent rolling on the ground, wounded from trusting while someone else stood and laughed at our fall. So we all try to be tough. Be strong. Be like Lucy. “It’s better to laugh at others than to be laughed at,” we say. But is that how we change the world, through ridicule and deceit? Do we change the world by keeping all of our emotions locked away? Do we change the world by never being vulnerable? Do we change the world by never giving ourselves away? This morning, the cross has an answer to that question. The cross shows how humankind often chooses the wrong things at which to laugh about and in the process condemns itself. You can tell a lot about the nature of a person’s heart by those things they joke about. 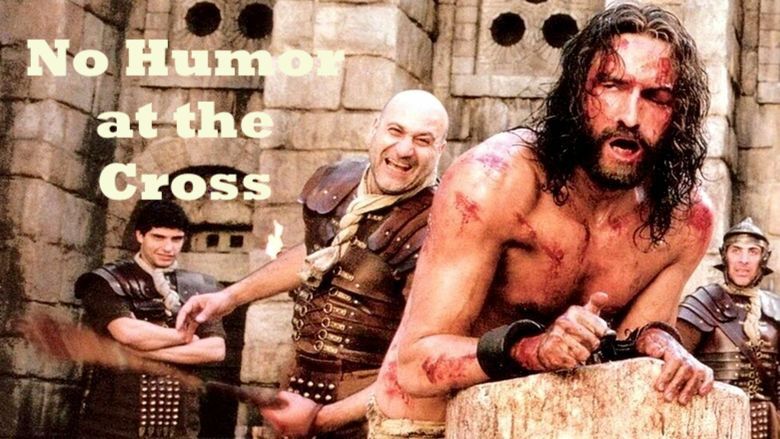 At the cross, the Romans thought that Jesus was a big joke. Here was a man from the Jewish people that had been preaching that he was their king. No doubt they had heard the story that he had prophesied that if the temple were destroyed, he would rebuild it in three days. How could he do that if he were dead? How could he do it even if he were not dead? The Romans thought his words were ridiculous. While he was referring to his body as the temple, they had no idea, but even if they had known that they would have thought that was even more ridiculous. At every point in the process, the Romans found something to laugh at Jesus. They laughed when the people chose Barabbas, a notorious prisoner who had robbed and murdered people to be released, while Jesus, who represented no physical threat to anyone, was sentenced to death. To the soldiers, Jesus represented the mindset of the Jewish race whom they believed was a stupid, no good, troublesome race of people. The Jews were the Roman’s primary source of ethnic jokes. And here in the midst of them was their self-proclaimed leader. As they ripped his robe off and placed the scarlet one on him, someone came running with a vine of thorns twisted into a crown. They put this on his head, and blood trickled down his face. Another soldier joined in the game by placing a staff in his right hand. They struck him on the head with the staff, and they laughed some more. As spit from their mouths rolled off the face of Jesus, they laughed even harder. The laughter of the soldiers moved from the Praetorium to Golgotha as they prepared to carry out the order of Pilate and the wishes of the people. Jesus was hoisted up on a cross. Don’t you see? The sign was meant as a joke. Look, a king on a cross. That’s a good one! The religious leaders joined in the laughter as they thought of his claims of being the Son of God, a man who said he could save others, yet could not even save himself. Even one of the robbers who was crucified with beside hurled insults on him. The forces of evil which had scoffed at Adam and Eve for trusting in God were now scoffing at Jesus who claimed to be the Son of God. Have you ever been laughed at or have you ever been ridiculed for your inabilities? Imagine if you had the power in just the blink of an eye, in one nod, in one word to call upon the angels to change the entire course of your situation as your enemies made great fun out of your situation. Why wouldn’t you do it? How great the temptation must have been for Jesus to yield to the scoffers, to silence their laughs then and there? How great must the temptation have been for Jesus to come down from the cross and show everyone that God is not to be mocked and that there is nothing illogical about the truth of God? Jesus chose to take it all. He decided to bear the pounding of the hammer, every insult, every gesture of mockery, every pain, every expression of laughter at him. As darkness covered the land, the shadow of the cross lengthened to reach out beyond all those who had laughed, mocked, ridiculed and crucified Jesus. It reached out to those who stood and wept as he died, to his mother Mary, to John the disciple, to the few women that were there. It even reached beyond to those disciples who had abandoned him, to those who found no humor at all in the events of that time. The shadow of the cross reaches beyond that time and place. It reaches even to us. We find that we cannot escape the shadow of the cross. Prompted by the appearance of the shadow, we look up, and we see and know what has been endured by Jesus. It is beyond our ability to comprehend that he went through all of the agonies of the cross willingly, out of love for us. No one wants to be laughed to death. Jesus was. Naked he hung there. Vulnerable. In pain. Suffering. For us. God loved us through Jesus. God experienced the cross through Jesus so He might taste death for everyone. Thus, God has shared in our humanity in all of its forms. According to Hebrews, Jesus was made like us in every way so that he might become a merciful and faithful high priest in service to God, and that he might make atonement for the sins of the people. Some of you here today know what it feels like to have other people laugh at you during certain periods of your life. You can still feel the pain of times when you were bullied, of times when you were told that you would never amount to anything, of times when you were told that you were not enough. You can still feel the isolation of friends and family who did not come to your aid when you failed but rather talked about you and made you feel isolated and alone. If you have ever been that person or if you are that person now, if you will look at the cross I can tell you that the love of Jesus is more than enough to help you heal from your wounds. Jesus is the one God sent to help us turn our weeping into laughing. He is the one who can teach us that those who laugh at us do not have the final word on how our lives are going to turn out. God wants to give you the power and the strength to say, “Father forgive them for they do not know what they are doing.” These people do not have the right to take your joy and create doubts about your worth as a child of God. This is God’s to give and if you will place your trust in God, he will heal your life and remind you that you will forever rejoice with Him. If you will constantly walk with Him, no one can steal that away from you. Finally, most of us at one time or another have been guilty of being among the voices yelling “Witch, Witch,” at some poor soul and joining in the fallen laughter that can break a person’s heart. God can and will forgive us of those times as we confess them. Is your laughter the kind that Jesus would join in with you? Would Jesus tell that joke? Would Jesus laugh at that incident? Would Jesus so belittle a person with laughter that he would destroy their self-esteem or cause them to doubt their self-worth? When we think of those times when we have hurt others by demeaning them, mocking them, and ostracizing them with our laughter, we realize that we have joined in the laughter of the soldiers at the foot of the cross. There is no joy in recognizing this sin as ours, but only in acknowledging that God responds to all of us by offering forgiveness through Jesus. If you have never accepted Jesus as your Savior, then you cannot possibly know the joy of salvation, which gives you joyous laughter that sets you free. It is a laughter that allows you to see yourself as you are so that you can continue to be made in the image of Christ. Today, you are invited to say “yes” to Jesus. I invite you to accept God’s forgiveness for your sins, including your fallen laughter. God will reward you with the laughter of joy–the laughter of discovery–the laughter of healing, for we were once lost, but now we are found; once blind but now we see.